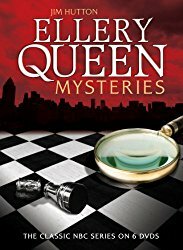 "Ellery Queen is the American detective story." That the name Ellery Queen was a pseudonym of two men teaming as one writer was, for many years, kept from the public. But the germ that was to develop into Master Detective Ellery Queen incubated in the mind of at least one of the men since he was a child, and the infection spread to his cousin some time later. When he was twelve years old, Frederic Dannay was sick. Nothing serious, just a childhood illness that kept him home from school for a day or two. His mother brought him a book from the library to help him through his ordeal. This was to prove of momentous impact to the history and development of detective, crime, and murder mystery fiction, for the book was The Adventures of Sherlock Holmes, and the boy would never be the same again. Some years later, Frederic Dannay and his cousin Manfred Lee decided to enter a contest sponsored by a magazine. To enter, contestants must write and submit a book-length manuscript. The winning manuscript would be published. They won! But the magazine folded before being able to publish their book. 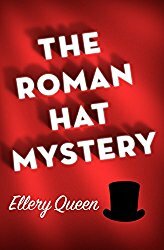 It was to prove of small consequence, for a book publisher was to publish their book -- The Roman Hat Mystery -- the first of many novels they were to write about their detective, Ellery Queen. Their concept was brilliant -- create a pseudonym (Ellery Queen), make it easy for readers to remember by repeating it throughout the book, and to do that simply give the detective the same name as the author. A young Ellery Queen, with all his early affectations (a cane, a monocle, and his oxymoronic brilliance contrasted to his attitude. One early passage claims, "He prided himself on a complete ignorance of the classics"). Inspector Richard Queen -- Ellery's father, as well as his touchstone to the inner circle of New York City's police bureaucracy. This gives the amateur sleuth access to the professionals and, quite often, inside information. Djuna -- houseboy to the Queens. In addition, we are introduced to J.J. McC -- who only writes the forewords for this first period of the Ellery Queen adventures. Mr. McC assures the public that Ellery Queen is alive and well, that Ellery is based on a real person though his name has been changed, and that he is married and living in a villa in Italy with his wife. 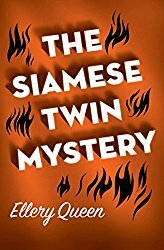 (A decade later, this information seems forgotten, as Ellery Queen is to become so different from the earlier descriptions -- dropping his affectations, becoming involved in several romances, and the like -- that Julian Symons was to conclude that there were at least two different men who used the name Ellery Queen. Symons's interview with an amused Frederic Dannay was published in Great Detectives. A Challenge to the Reader let the reader know that "Dear Reader, you are now in possession of all the clues and should be able to solve the mystery." (This is a paraphrase and conveys the gist of the challenge. In truth, each Challenge to the Reader was unique to the book for which it was written. One even intimated that more evidence would surface but that you, the reader, would find it unnecessary because you could solve the crime with the clues you already possessed!) The famous Challenge to the Reader appeared in a box at the appropriate place in each book. 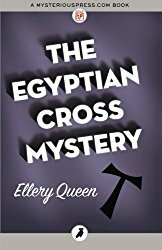 Commentators, critics, reviewers, and fans agree that Ellery Queen mysteries are unique. The Ellery Queen books hang together so well -- the logic is so intricate -- that when Ellery Queen (the detective) reveals the murderer, it really can only be whoever Queen identifies. Other fictional sleuths often leave the reader in doubt. (I remember reading a mystery writer's advice to would-be authors once. The advice was to read a mystery, try to figure out who the culprit is, and if you're wrong then you've already got your plot and your own solution!) But one cannot do this with a Queen book, and subsequently Queen is referred to as "The logical successor to Sherlock Holmes." In this instance, the word "logical" refers to the fact that in a Queen plot one person, and only one person (unless it's a collusion where more than one person is involved in the crime) can "logically" be the criminal. The plots are absolutely airtight! The Hollywood Period. The Ellery Queen series of murder mysteries continued beyond the first period. Queen was to change as Dannay and Lee were brought to Hollywood to write screenplays. They developed novels as tie-ins to the films. The Wrightsville Period. Returning to the East Coast, Dannay and Lee made a serious attempt to create a new, more naturalistic type of detective story. 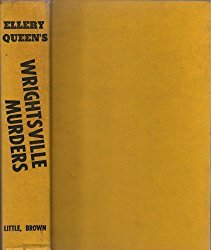 They invented a town called Wrightsville, and Ellery Queen solved several mysteries here. One of these, Ten Days Wonder, was made into a film by Orson Welles (who used the plot but left Ellery Queen himself -- who was central to the plot of the book -- out of the film altogether). Anthologies. 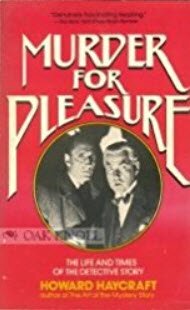 A number of indispensable anthologies reintroduced classic detective stories, murder mysteries, and crime stories that may well have been lost and forgotten had it not been for the Queens's diligence. Among these were Rogues' Gallery, which grouped fictional criminals in one place; another anthology which introduced Pulitzer Prizewinners who had written mysteries; Female criminologists and criminals; and my personal favorite -- Ellery Queen's Challenge to the Reader. This last book changes the name of the author and of the detective for each story that is included. The reader is challenged to figure out who the actual detective and who the real author are. This book introduced me to the detective Astro, and to others whom I had only read about previously. 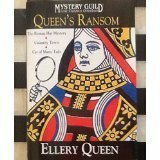 Ellery Queen's Mystery Magazine. This important magazine included in each issue at least one story by a previously unpublished author. It also included rare stories that Dannay and Lee had discovered, and which they introduced to the public. These included a detective story written by none other than President Abraham Lincoln, and President Woodrow Wilson's article "Holmes was an American." The Haycraft-Queen Definitive Library of Detective, Crime, and Murder Mystery Fiction: A Reader's List of Detective Story Cornerstones. After Howard Haycraft published his classic Murder for Pleasure, which included a list of detective story cornerstones, Queen (actually, Frederic Dannay) approached him and urged him to produce a second, revised edition to include more recent books he felt destined to be classics (he was correct) and to ask if he could embellish Haycraft's list of cornerstones. The result included the list of cornerstones which many, many aficianados of detective story fiction (myself included) use as a guidepost to develop our personal libraries. This has been, and continues to be, an indisputable contribution to the continuation of the genre. This is the place to start when beginning one's collection. Ellery Queen radio programs. Dannay and Lee wrote a series of radio shows about Ellery Queen. It introduced Queen as "an American Sherlock Holmes," a versatile man, and a busy one. These radio programs included Nikki Porter -- Queen's secretary, who was introduced in the Hollywood period (first in films and then brought into the novels). Celebrities were invited to take up the famous Queen challenge and present a solution before a live audience. Queen would then reveal the true solution and explain why it was the "logical" one. Drury Lane. Dannay and Lee invented character Drury Lane and created a new pseudonym -- Barnaby Ross. Lane was a retired actor from the stage who applied his art to life to solve crimes. Readers were unaware that Drury Lane and Ellery Queen were pseudonyms. What fun they must have had when they toured! Audiences were unaware that both authors collaborated under both pseudonyms. This made it possible for one cousin to pose as Queen and the other as Ross. They scripted their appearances to convince audiences that they were competitors, and they challenged each other to publicly solve mini-mysteries. Wouldn't it be grand if some of these appearances were recorded and survive? At this writing, I am unaware of any such recordings, but I would love to hear them if any become available. Dannay himself was a great collector of detective books and stories, including rarities. Somewhat disappointing is the fact that the cousins farmed out the last six to ten Ellery Queen books to other authors. I read two or three of these before I discovered this fact. Now that I know it, I realize why I was unenthralled with the ones I had read. The final three (of some forty books that they had written) remain on my library shelves unread, although many of the earlier ones I reread several times over. They also farmed out whole series of detective stories and novels (some are listed below). Ellery Queen short stories. These are not to be overlooked. 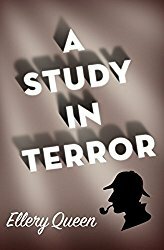 They range from short-shorts of a page or two to classic attempts to solve, say, unwritten Sherlock Holmes cases with a highly-satisfying solution (as in the novelette "The Lamp of God," in which Queen solved the unwritten Sherlock Holmes case about James Phillimore, who was seen by witnesses to step back into his house and was never seen again). You owe it to yourself to sample this remarkable series. Neither Queen nor his father appear in this. It looks like it was farmed out to a ghostwriter. Ditto above -- I think this was farmed out to a ghostwriter, and it didn't include Queen or his father. Another non-Queen Queen. Neither Queen nor his father appear in this one, and it looks like it was farmed out to a ghostwriter. Yet another non-Queen Queen. See my comments above -- Queen and Inspector Queen are missing in action in this one; it seems to have been ghostwritten. Yes -- yet another non-Queen Queen. See my comments above. Neither Queen nor Inspector Queen appear. Ghostwritten. Not a real EQ. I think Queen and his father are absent from this one. But Manfred Lee insisted it was not ghost written, and Frederic Dannay confirmed this. This omnibus contains the three Wrightsville novels, which attempted to create a new type of detective story. Not to everyone's taste, but historically important. And I, personally, love them! Orson Welles made a film of Ten Days' Wonder -- but he used the story itself while leaving Ellery Queen out of his version. Tim Corrigan books were all apparently ghostwritten under the Ellery Queen name. These were also apparently ghostwritten under the Ellery Queen name. Radio show scripts include the following. The superb television series is faithful to the spirit of the actual stories. Every episode includes a "Challenge to the Reader," where Ellery "breaks through the fourth wall" to challenge the viewer.